LIANJIANG, China -- On September 13, 2007, early morning, fishermen from Lianjiang, Fujian Province caught a giant whale shark. It weighed 8.5 tons and was 8.5 meters long. 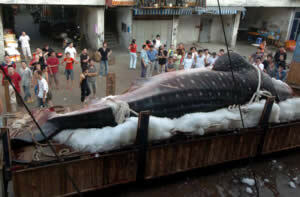 After the whale shark was slaughtered, it was delivered to Zhejiang Province. There, it was sold for 85,000 yuan (USD 11,300). According to experts, such a large whale shark is rarely caught along the Fujian Coast. According to the mainland newspaper, The Straits News report, the local fisherman who caught the whale shark was 33 year old Lin Jianhai, "This is the first time that we have seen such a big fish for so many years. Before, I had seen whale sharks weighing around 2 or 3 tons. However, we have never caught any before." Lin Jianhai said that the total income from fishing this year so far could not compare with the selling price of this large fish. This shark is a female and its entire body is black. The fin itself measures about 1.5 meters long. Its mouth is very flat without any teeth. There are many white spots all over the body and the fins. Each lemon-shaped spot has a diameter of about 15 centimeters (6 inches). The locals call it the "money-shark." According to the Fujian Province Natural History Museum researcher Li Shuqing, its official name is a "whale shark." The whale shark is not considered a protected fish. However, according to the Convention on International Trade in Endangered Species of Wild Fauna and Flora, the money-shark (whale shark) is classified as an international endangered species. The protection is a level two under the national animal protection regulations. This species of shark feed mostly on plankton through a mouth filter and is considered the largest living fish. According to experienced fisherman and seafood businessmen, the most valuable parts of the whale shark are the fin and the bones, which are used for making medicines and tonics. They should really stop killing the whale sharks and just do in Makos and Great Whites - those are the ones that need to be get rid of! ( c who's more dangerous for pips!) This is just sad! Third one this year! Dumb chinese! Killing any sharks at this point is bad - we are wiping out the oceans' apex predators and creating huge imbalances in the marine environment as a result. As an alternative, I suggest open season on the less than intelligent person Al, sho suggested going after Makos and Great Whites. Talk about bottom of the gene pool. It is China, that is really all that needs to be said. They electrocute dogs, have no Quality Control, they allow one child, then they slaughter gentle giants for TONICS & APHRODISIACS. Obviously they have deeper seeded issues. I wish we could write them off entirely. China disgusts me. The worst part is that the article describes how it will be used for "medicines and tonics", of which research has repeatedly shown is completely useless, and potentially harmful. Until the media changes its perspectives on sharks, the general public will not either. I can understand people being upset,angered and disgusted by this and other atrocities committed by China but how can you go from being a caring, compassionate conservative person to wishing the annihilation of a whole nation or open season on a single man over fish. oxy moron ? If you were a poor fisherman living in poverty, you would probably do the same thing. Imagine being able to double your yearly income in one day! This sort of thing is going to continue until the Chinese government begins protecting endangered species. Don't be mad at the fisherman. He's just trying to make a living. It does sound gruesome but in the United States we have do our share of senseless murdering of sea life by polluting the environment directly and indirectly. We have contests to see who can bring home the largest of a trophy fish. These people are making a living. Why don�t you complain about the long line commercial fishermen, who kill more sea life indiscriminately than most and just throw it back in the ocean. In my ten or more years of diving I have seen people do stupid things to sea life. I to don�t like it but until we all realize we are killing the future generations by our actions that just how it will be. I am so sick of these dumbass killing all these sharks. I'm a shark fisherman and I release all my catches! They are going to eat the fornicating thing, not use it for medicine! I hope they choke on it! "They should really stop killing the whale sharks and just do in Makos and Great Whites - those are the ones that need to be get rid of! ( c who's more dangerous for pips!) This is just sad! Third one this year! Dumb chinese! - Al � USA � Sep 21, 2007 @ 5:30pm " That has to be the most ignorant statement ive ever heard. If you rid the seas of makos and great whites there would be dire consquences. Whale shark probally would probally go extinct, maybe whales too. Think of the overpopulation of fish that eat plankton, thus less plankton for your precious whale shark. Think before you post please. I agree with Joel. It is ignorant satements like AI's that perpetuate myths about sharks. It is a fact that vending machines cause more deaths annually than shark attacks. The poor fisherman of the world are responsible for the decimation of over 90% of ALL shark species! Not to mention the impact this over fishing has on global warming. OVER 100 MILLION SHARKS ARE NEEDLESSLY SLAGHTERED EVERY YEAR! This needs to stop. go to www.savingsharks.com and please don't make comments about things you are uneducated about. How does overfishing(which I am against) impact global warming? i think that this is an absolute disgrace. why they would want to kill a dying species for their own amusement is beyond me. once more the Chinese.....!! and its not just them it should be illegal!!! yeah! im sick of it to. it should be llegal. i mean what on earth did these poor creatures ever do to us. i so hope that anyone who eats thins poor poor creature ought to choke on it and die. i love whale sharks. i can under stand the killing of other sharks but no these whale sharks didn't do anything to us. i mean how could they their completely harmless!!!!!!!!!!! Most of the biased commentators here are in need of a reality check. Seafood is a delicacy in East Asia. Japanese, Chinese, Koreans, among many other peoples love to eat all sorts of fish. Americans and Europeans do so as well. Sharks are harmless just as cows or pigs are harmless. They are a resource. Don't think that your lifestyle is any better than theirs. America is probably the most wasteful society on the whole planet. While I agree it is quite sad that whale sharks are dying, anyone who says other sharks should be killed is quite ignorant. Sharks keep the ocean in balance, and most of our oxygen comes from the ocean plants and bioplankton. Sharks are some of natures most perfect creations and deserve there place on earth more than people who commit practices like this. 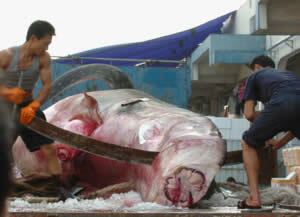 sharks have earned there place n earth and slaughtering like this in murder. without sharks the entire ocean could go out of whack. sharks, such as this peaceful giant, deserve to be protected and treasured. If you disagree with me, go watch the movie shark water or research this stuff online or in the library before saying stuff like all sharks should die. these are not man killing monsters, but powerful creatures in need of respect and protection, for their sake and ours. dat fing is HUGE!!! FEAST TYM TO DA SOLOMON ISLANDERZ!!! YUMMY!!! not!!! its the heritage to eat anything and use the whole animal. one killed isnt going to affect anything. at least its not wasted. the government will likely do nothing until it gets really low population or do nothing. I wouldnt complain chinese have been around for millions of years. Something that big and beatiful should just be left alone!!! sorry i don't really want to say my city and country. but that is flipping wrong, the whale shark is harmless to humans ! i've have a small experience with one; me and my cousins were at a beach by the gulf of mexico and a whales were slamming their tails on the ocean water. we got a couple noises on camera too. but they need to kill those other sharks. i hear they taste like chicken. and if they can't settle for that they need to go back to their crab ragoons. lmbo. china need to stop killing these for food btw i would like to know how u got it in the boat also how long did it take u to get it in and how much was your rod bending. thats just stupid, whale sharks are harmless we can go really close to them and they dont even harm us. its wrong. it has a soul!! How could they do such a thing to this innocent animal! I CANNOT believe that people would do anything that CRULE!!!! I mean it's still a living breathing thing! what if that were them? There are other over populated species that they could kill but NOOO they want to kill a harmless possibly endangered species. And yes it has feelings to! (even if you don't know what those feelings are) Also It has a family!!!! So please help stop the killing of animals THANKS A BUNCH 4 READING THIS!!!! Why should loving or simply admiring an animal be any less of a reason to want to protect it? Calling it endangered is mereley a label. If people cant connect with an animal and identify its importance, why should they care if it lives or dies? People want to protect a species because they see relationships between themselves and the animals. For example, some people want to prevent finning because of the inhumane treatment of the animals. Others because of the irresponsible management of the harvest itself. In those two categories alone you may find environmentalists that see the impact on the ecosystem, you may find a photographer wishing to film the animal, ordinary people who want thier children to share the experience, or even the fisherman themselves who rely on the animal for income. Some animals do get overlooked because they are frightening or unattractive. People DID care about the merciless over fishing of sharks, it just takes time for others to catch on. When it comes to protecting wildlife, one must first get inside the heart to get inside the head. There are many reasons for people to want to protect a species, be it for economic, political, biological, or emotional reasons; all should be considered legitimate. MJ, i totally agree with you. You are so right! We really need to protect the oceans and pay attention to what is going on. All the different reasons are legitimate. You should only kill what you're going to eat. I hope Whale Sharks taste like crap? God only knows what will happen to them if they're considered a delicacy?? All sharks should be left alone! God put them on this earth for a reason. Humans do not have the right to kill them just because we're scarred to get attacked when we swim etc. Life is a gamble! When you enter the water your gambling. If you don't like the odds then stay out of the water. I myself, love the ocean and I think the gamble is worth every minute!! Sighz... its so sad to see an animal like this being slaughtered and eaten by people >. As another has been caught today apparently dead. All it awakens within me is great sadness for what we as the most intelligent of species are doing globally to innocent creatures. When will we stop destroying and begin respecting all forms of life on this planet? A sad day for humanity!! It is very unfortunate that this whale shark was caught as whale sharks are often curious of people and are completely harmless to them.